The major monument of Bosra. 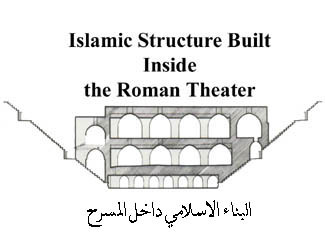 The Roman theatre of the early third century A.D. gives visual evidence of the grandeur of the city in classical antiquity as well as the importance of Bosra throughout the Muslim period. The exceptional state of preservation of the theatre is the result of its secondary use as citadel and palatial residence in the middle ages. 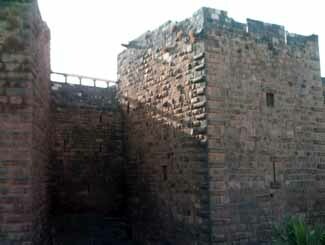 The exterior of the building was protected by a complex defense system of a total of eleven strongly fortified towers, for which many of the ancient monuments of the city were quarried for building materials. 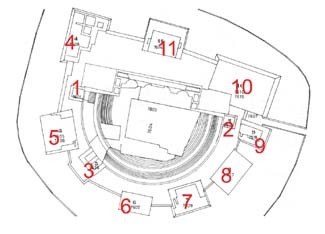 Also the interior was almost completely covered by structures of three stories, filling the area of the theatre. Though these interior structures were cleared away from 1946 onwards in a long program of restoration aimed at the restitution of the Roman theatre, the citadel remains one of the best preserved medieval examples of Islamic military architecture. 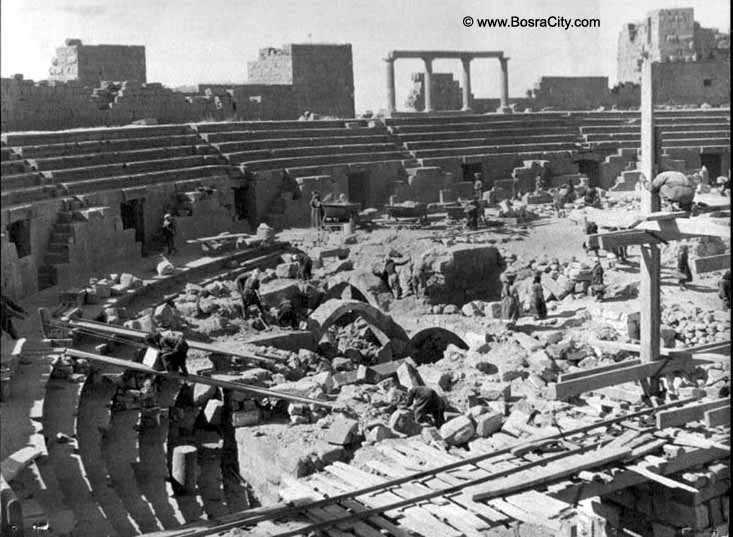 Serving as the southern most outpost of the Syrian capital Damascus, the citadel of Bosra was created in a long series of building activities extending for a period over one and a half century. 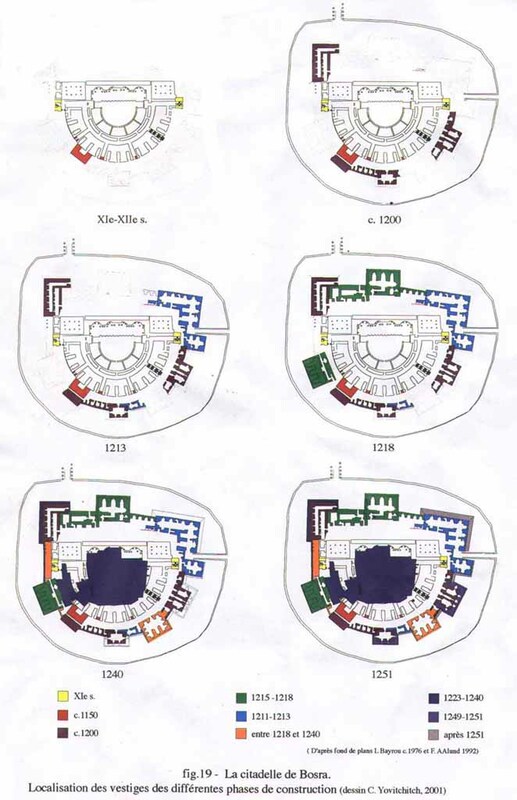 The history of this singularly complex fortification system mirrors the development of the city. Construction started at a modest level in the late fifth – eleventh century, shortly after the Syrian capital was conquered by the Suljuks from the Fatimids in 468 / 1076. 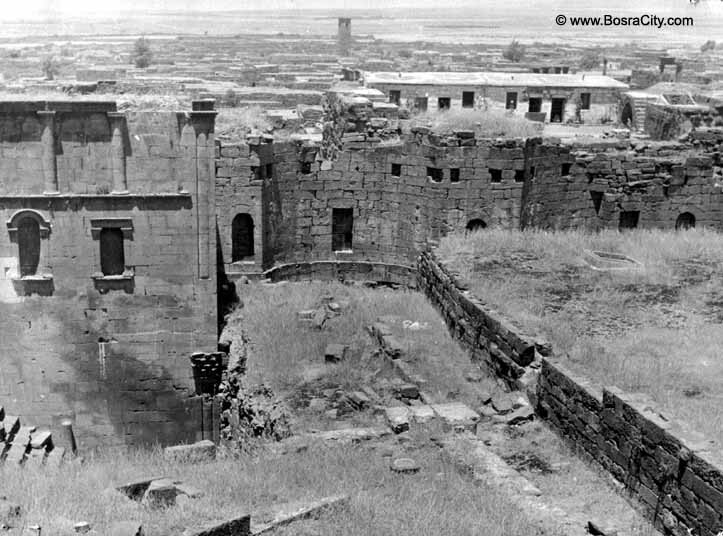 As protective measures against the fatimids the two staircase towers (1 / 2) slanking the scaena of the theatre were altered for defence purposes by order of the Tufkish general Shams Ad-Daula Abu Mansour Kumushtakin in 481 / 1088 according to an inscription discovered in 1948 during the restoration. The better preserved western tower (1) indicates that an additional storey was added with a single room divided by two transverse arches carrying the basalt slabs in the traditional Haurân pattern of architecture. Consequently all the numerous openings to the outside of the theatre had to be closed off at the same time. The crude masonry blocking some of the original entrances in the exterior wall could very well date from this first defense system. This initial fortification was further strengthened only after an interval of sixty years by an additional southeastern tower attached to the cavea façade in (542 / 1140 – 549 / 1154)in anticipation of an attack from the Crusaders. Again as with the previous construction this tower has the characteristic features of Haurân architecture. In this respect the fortifications reflect the same stylistic level as most of the religious monuments erected in the first half of the sixth / twelfth century, when the Muslim city of Bosra witnessed the beginning of a period of prosperity. 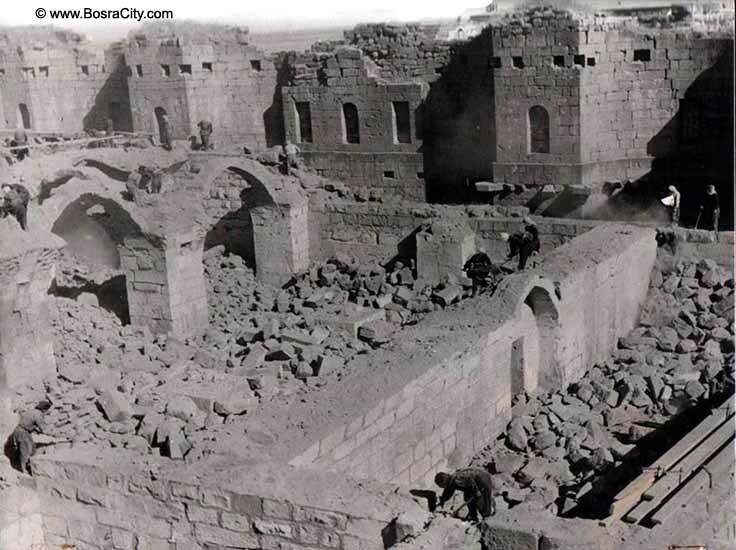 In the formative period of Ayyubid rule in Damascus, a second period of construction was initiated. 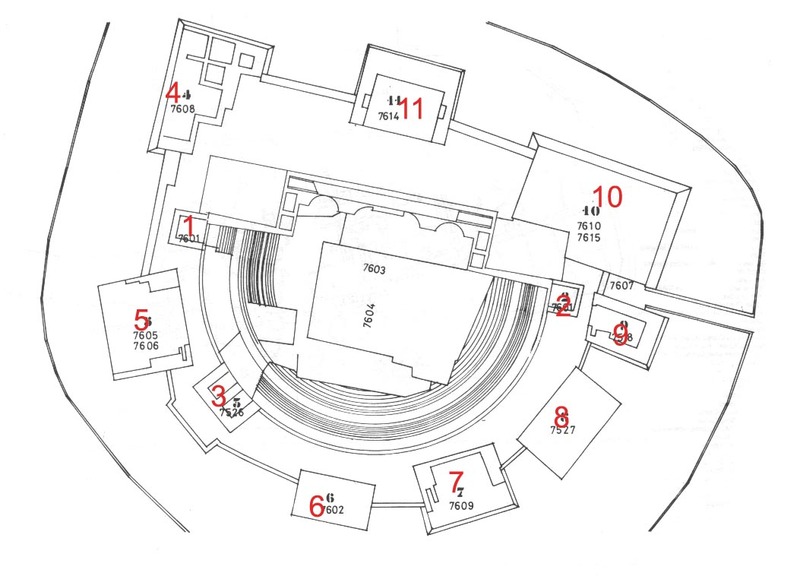 Within two decades an outer defense system of eight rectangular towers was created encircling the previous structure at some distance to leave room for a complex of interior corridors and defense installation. Most of this monumental program is to be credited to the Ayyubid ruler of Damascus Al-Adil Abo Bakr (592 / 1196 – 615 / 1218). The work first centered on the north of the exterior scaena façade. Starting at the northwestern corner, where a massive tower (3) of 22 X 31 m. was constructed in 599 / 1202 – 03, named the "Tower of Founded Victory" (Burjannasr Al-Ma'mur), as stated by the inscription on the eastern façade. It was built by the architect Ibrahim B. Ali B. Fuhaid under the supervision of the governor of Bosra, Sunqur At-Tughrultakini. Though considerably altered in the Ottoman period, the lower storeys clearly demonstrate a vaulting system so for unrecorded at the region, suggesting the transplantation of imperial architectural trends from the capital Damascus to the provincial city of Bosra. The same is the case with the monumental entrance tower (1) of 25 X37 m at the northeastern corner, commissioned in 608 / 1211 – 12. After its completion, work was immediately continued on the similar protective tower (8) in front of the entrance portal in 609 / 1212, terminated within an amazingly short period of eight months in 610 / 1213. as testified by the building inscription. The construction work of both towers was administrated by the officer Rukn Ad-Din Mankuwirish Al-Falaki, who was also responsible for the construction of the central northern tower (2), completed in 612 / 1215 – 16, as well as for the southwestern tower (4), finished in 615 / 1218. The work of the two later towers on the spot was supervised by the officer Shihab Ad-din Ghazi Bin Aibak Ar-Rukni. 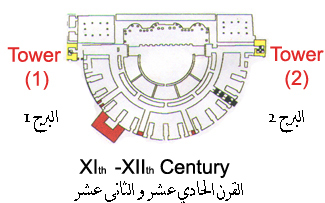 Both these towers, tellingly of identical dimensions of 20 X 25 m, are characterized in the second storey by an axial plan layout quite similar to the " Madrasa" attached In 530 / 1136 to "Al-Mibrak Mosque", four iwans are oriented towards the vaulted interior courtyard, of which the lateral pair is closed off by partition walls, but pierced by triple doors. These room interiors of a distinct palatial appearance obviously were designed for representative functions of the governor of Bosra and the citadel. The same arrangement is in evidence in the southeastern tower (6) , which is of markedly lesser dimensions measuring only 17 X 21 m.Strangely enough, this is the only tower of the citadel without a building inscription, but the plan layout argues for a date soon after the parallel southeastern tower (4), probably shortly after the death of the Ayyubid Al-Adil Abu Bakr in 615 / 1218, when Bosra was bequeathed as fief to his son As-Salih Isma'il. 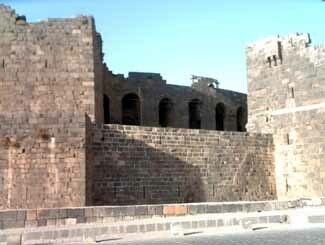 The period of this Ayyubid prince who held the fief of Bosra until 644 / 1246, for most of this time residing in the citadel, except his two terms of office as ruler of Damascus and the Syrian lands from 634 / 1237 till 635 / 1238 and again from 637 / 1239 till 643 / 1245, is to be considered as the golden age of the city of Bosra. As the residence of a prince from the ruling dynasty of the Ayyubids, the program of fortification was followed by a internal improvement of the citadel. First a mosque (Jami') was commissioned in 620 / 1223, to be erected on the scaena of the theatre, followed by a vaulted cistern on the cavea, for which water was piped in from the open cistern (Birkat Al-Hajj) nearby, reactivated at the same time, and supplying a spacious batgh inserted into eastern portico of the theatre. A vaulted structure was added on top of the water tank from 625 / 1227 – 28, onwards with an additional storey for the arsenal founded in 629 / 1231 – 32, further storage space for agricultural products was again constructed in 640 / 1242 – 43. All these building activities were supervised by the majordomo Badr Ad-Din Dawud Bin Aidakin. Only at the time of the second term of office as principal Ayyubid ruler of Syria As-Salih Isma'il seems to have developed a new interest in the fortification of his home residence. In 638 / 1240 – 41 he ordered the erection of a glacis at the northwestern corner tower (4) possibly continued with similar operations at both entrance towers (9 - 10). Eventually at this time, the southeastern tower (6) was flanked by two smaller towers to reinforce the protective chain of tower strongholds. The western one (6) of these, originally only 10 X 15 m in 647 / 1249, 50 m was considerably enlarged to 12 X 19 m by order of the Ayyubid ruler of Damascus As-Salih Ayyub (636 – 637 / 1239) and (643 / 1245 – 647 / 1249) which was carried out by the officer Shuja' Ad-Din 'Anbar. Motivated by the threatening advance of the Mongol forces, the eastern flanking tower (7) was also further expanded from 11 X 18 m to impressive dimensions of 18 X 24 m. This final defensive building operation was commissioned by the lost Ayyubid ruler of Damascus, An-Nasir Yusuf II (648 / 1250 – 658 / 1260), and supervised by the commander of the citadel, Yaqut. Despite these efforts, the citadel of Bosra as all the other fortifications of Syria, could not stand the attack of the Mongol army. But only after a short period of occupation, the Mongols were again chased out of the Syria lands by the Mamluk army of the Sultan Az-Zahir Baibars (658 / 1260 – 676 / 1277)in (658 / 1260), who in turn immediately organized the repair of the damage inflicted on the castle by the Mongol siege. From this time on a garrison was established in the citadel to ensure the safety of agriculture and commerce in the region. 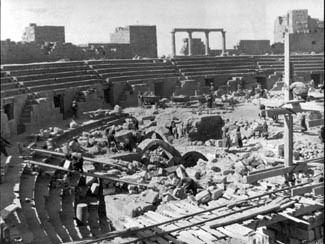 As a result of the recent restoration efforts by the Directorate of Antiquities, lasting from 1946 to 1970, the Roman theatre is now again put to use for annual cultural festivals. The monument in addition has regained a new function as a regional museum, housing an archaeological collection displayed in the southeastern tower (7), as well as an ethnographic collection in the southwestern tower (5). The interior platform in front of the central northern tower (11) is used for the display of antique sculptures and historic inscriptions collected from the ruins. In the course of this restoration program, including the cleaning and restoration of the impressive exterior defense, most of the interior structures had to be sacrificed. As a last indication of the splendour of the residence of the Ayyubid Prince As-Salih Isma'il, originally concentrated on the cleared away interior structures, the water basin of the palatial bath in the eastern courtyard of the theatre has been transferred to the exhibition hall of the ethnographic collection in the southwestern tower (5). Most remarkably the overflow channels surrounding the basin are paved with colored mosaic, depicting bish and water bird, still transmitting an impression of rather pleasant environment created for the medieval princely residence within the rather stern military complex of the citadel.